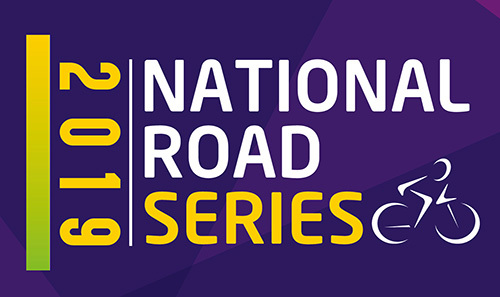 In excess of 120 riders are entered to tackle the 133km Men’s National Road Series round one, with more than 30 bound for the newer, 67km Women’s National Road Series leg. Set to headline in both races is Team Bioracer-DHL-FR Services, who have been cleaning up on the domestic road racing circuit this season, particularly with their male U23s. Just last weekend Luke Smith won the Boyne Valley GP and Conor McCann took the aptly-named McCann Cup in Omagh, John Buller enjoying top 10 finishes in Omagh and at the Tour Of Ards, where Smith was second on Sunday. Team manager Tim Cassidy said: “Luke Smith, Conor McCann and (National Criterium Champion) Dillon Corkery, if healthy, are in fantastic form and showed it with their wins at the weekend. A team of 10 riders has been entered for the Des Hanlon Classic, but there are concerns over some, the hectic start to the season in bad weather perhaps catching up on the young stars. Cassidy explained: “Dillon Corkery is selected for the Ghent Nations Cup but has pulled out as he was sick at the weekend and did not finish Ras Maigheo. He will make a decision on the Des Hanlon on Friday. In the Women’s National Road Series event, Team Bioracer-DHL-FR Services will have Jennifer Bates, second in Sunday’s 10-mile Breffni TT. But favourite is set to be last year’s solo winner Katharine Smyth from Ballymena Road Club, who went on to be second overall in the National Road Series General Classification. In what could be the biggest ever Women’s Des Hanlon Classic field, there will be a notable absentee as last year’s National Road Series winner Aine Donegan (Scott-Orwell Wheelers) has decided to take a year out from the competition. Donegan, a former top triathlete, converted to road racing last season quickly making it on to Ireland’s international road racing team. However, purchasing a house has changed priorities for now. 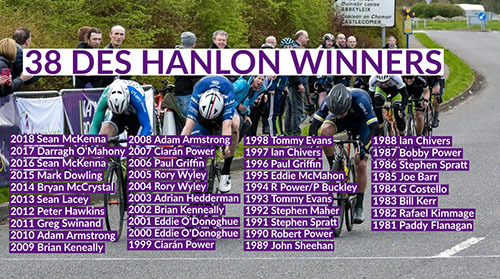 First run in 1981 to commemorate the life of Carlow teenager Des Hanlon, who had been killed the previous Christmas Eve when hit by a car as he cycled on local roads, the Men’s Des Hanlon Memorial Classic has been won by some of Ireland’s most decorated cyclists. Continuing that trend, the 2017 winner Darragh O’Mahony, 21, won the climbers polka dot jersey at the UCI-ranked Tour De Normandie in France last Sunday. For all Men’s and Women’s Des Hanlon Classic winners see below. The Des Hanlon Classic is hosted by Carlow Road Cycling Club and will be covered live on Twitter via @CINatRoadSeries this Sunday from early. The Cycling Ireland National Road Series is a seven-race league incorporating Ireland's best one-day road races. Points are accumulated down to 20th place in each Men’s and Women’s race, the winners walking away with €600. For 2019 there is an additional €300 Team Classification. In 2018 Aine Donegan (Scott-Orwell Wheelers) and Conor Hennebry (now Team Dan Morrissey-Mig.ie-Pactimo) finished top of the Women's and Men's National Road Series General Classifications.